I’ve never had the thought of reading for fun. I always thought it was boring. Every time I came to class in elementary school, though, I’d see the same girl behind a book. I remember asking her, “Why do you read?” And I remember her looking up at me and having a small smile across her lips. “Well, because it’s fun. There are a lot of interesting books.” The tone she used made her sound so right, like she knew what she was talking about. I still didn’t understand. Until one day, my life starting taking rough turns and I ended up being stressed out most of the time and wanting to cry. I felt angry and I never wanted to go anywhere, I didn’t want to eat or talk to anyone. Just spend time to myself. My life was a massive tornado spinning endlessly into a small town that could barely even manage. I don’t know how it happened, but I just remember reading something, and all of a sudden, it was like my problems never existed, it was like I had never existed up until that point. It felt so unreal and beautiful to suddenly forget why I was ever upset. It felt so much satisfaction to read someone’s story. My problems never concerned me anymore, I was happy to be reading. Reading was my own therapy. 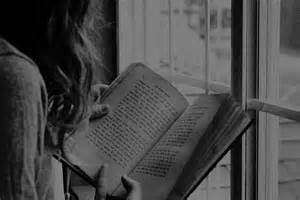 When I read, suddenly everything vanishes, people’s voices turn to nothing but whispers and I feel as if nothing has existed; I’m here but at the same time I am not. I read the book and suddenly I see everything, it’s like I am hallucinating a story written. A movie almost invisible in my eyes, but still there. Reading has really helped me escape and is definitely helpful for entertainment. I was helplessly lost in such a fantastic way inside a million stories. Each character so different, but they are all brave and heroic at times. I’ve been reading ever since; about characters who are always smiling and those who are brave, those who are agile and smart. But it wasn’t until I realized why I read books with such fantastic characters. I read those books because those characters were everything I wanted to be. Even if the characters are inhuman, you don’t have to be human to choose to be brave. So I never stopped reading, because it made me feel like I was brave too. I appreciate that you still read the Condor Press, Kassidy and Claudia.